Before you start working with AdWords and learn about each element of the account and options you can use to optimize your work, you should fully understand the AdWords account structure. Not only will this help you with organizing your campaign, but it will help you grasp how AdWords program works and how to create and manage effective campaigns. There are three layers that make up AdWords program and they represent different levels of the account. One account is associated with one email address, a password and billing information. Even though you can allow other users to access the account, using account access settings, one account is always linked to a single email address which is considered to be primary. When you access your account, you can create campaigns. Each campaign has its own settings and budget, which helps you determine how much you are going to spend on that particular campaign, as well as where and when your ad is going to appear. Creating different campaigns is recommended if you have several types of products or services you want to advertise, as well as if you want to choose different settings to optimize the reach for different product or services. For example, if you are a clothing brand, you would create different campaigns for women’s, men’s and children’s clothes. In this case, you basically separate the types of products so that you can employ different campaign settings in order to optimize the campaign and maximize the click through rate. Each campaign has a certain number of ad groups. An ad group is a group of similar or related ads and keywords. Ad groups help you focus on different products inside a certain type of product. For example, if you have created separate campaigns for different types of clothing, you would focus on a single type of clothing inside an ad group. If the campaign was designed to promote women’s clothes, you would create ad groups for dresses, trousers, T-shirts, handbags, etc. When you create an ad group, you have to choose a list of keywords that are related to the ads or the ad group. 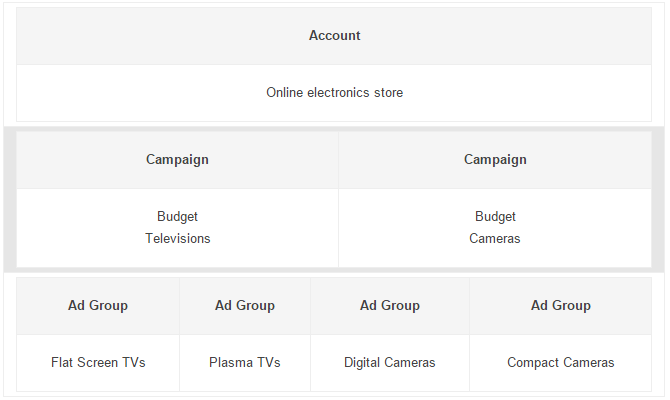 Even though the account limitations allow you to create a larger number of campaigns, ad groups and ads, a general recommendation is to create campaigns with several ad groups. Each ad group should have between two and four ads and you should ad between 10 and 35 keywords per ad group. Google recommends using this structure as it is much easier to handle and mange your account, if you have a simple structure. This will allow you to quickly navigate through the account and monitor the performance of your ads.